My honor was at stake. The last time we visited Mr. Spice’s parents, we spontaneously decided to go out for dinner one night. Our first choice was this vegetarian Indian restaurant that serves dosas, which we all love. However, everyone else must have had the same idea, because the line was out the door and showed no signs of moving. This left us grasping for other options. My in-laws don’t go out to eat very often, so they had a hard time suggesting other places. We drove around while they tried to remember a couple places, but they had gone out of business. All the while, Mr. Spice and I were frantically trying to make use of technology and looking up places on our iPhones that would appeal to his parents. I finally found what I thought would be a safe option — a Chinese restaurant. The reviews looked okay and it was nearby, so there we went. Yeah, I’m still trying to live that one down. I’ve had bad Chinese food before, but this place was just sucky. Greasy, bland, and at the same time too salty. So I made sure that when we went down to visit this past weekend that I would do my homework and pick a place that would redeem me and please our palates. It’s a bit tricky trying to find a restaurant that will work for all of us. When my in-laws go out to eat, it’s usually for Indian or Chinese food. We’ve done Chili’s a couple times. They just don’t go out to eat a whole lot and my mother-in-law has some digestive problems that flare up sometimes and make it hard for her to eat out. That’s all fine, but I wanted to break out of our pattern a bit and felt up to the challenge. 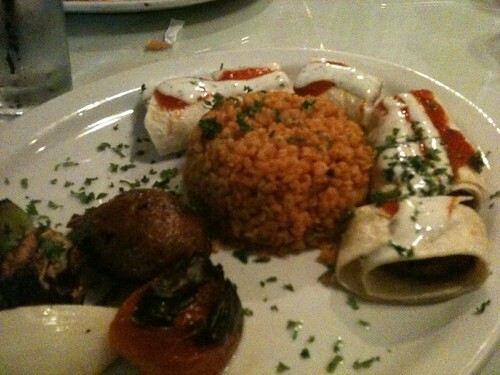 I read around a bit on some foodie sites and decided on Anatolia Mediterranean Cuisine. One look at the menu and I just knew we’d all find stuff we liked. It’s Middle Eastern cuisine, so I knew the kebabs would appeal to my in-laws, plus I will admit to a slight obsession with Middle Eastern food right now. Meaning, I haven’t had the chance to have much recently, so I’ve been dying to have some. The weather that night was absolutely perfect — warm and breezy and no humidity. The outside seating was packed with people chowing down on delicious-looking food and inviting aromas wafted out from the front door as we approached. We ended up sitting inside, but were right by the door and window, so it was like the best of both worlds. I had already ogled the menu online, so I knew what I wanted. 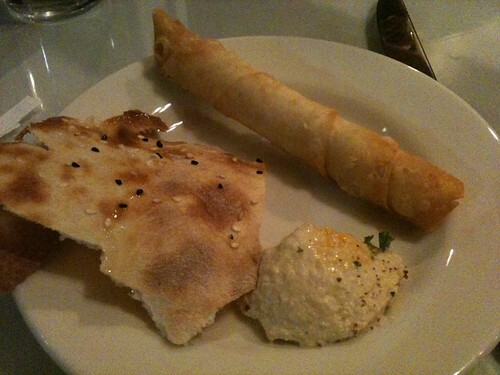 I ordered some appetizers for us to share to start us off — hummus, lavash bread, and sigara boregi, which are cigar-shaped turnovers made from feta, herbs, and phyllo dough. Check out the lavash! 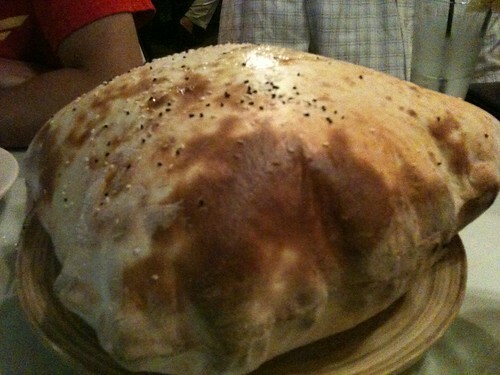 It was a huge pillow of thin and crispy bread, fresh from the oven and just begging to be torn into. And what a job we did! The crispy lavash made a great accompaniment to the creamy hummus. My favorite was the sigara boregi. I had read about them and was happy to see them on the menu, so I went for it and ordered them. Hot, salty, creamy feta cheese and herbs surrounded by a crispy crust. I could get addicted to these. For our entrees, we all ordered some form of kebab. Mr. Spice and his dad ordered the kuzu kebab, which were lamb shish kebabs. His mom ordered the tavuk adana, which were ground chicken kebabs and something I had considered as well. I got the beyti kebab, which were a spicy version of the adana kebab (ground lamb kebab), wrapped in pita and topped with tomato-garlic-yogurt sauce. I’m really not a lamb person, but will tolerate it in things like gyros, so I hoped that all the spices would drown out any lamby tastes. Our entrees came with the choice of rice or bulger, as well as grilled vegetables. I chose bulgur, just to try something different. So what of my lamby fears? There was a slight lamby taste, but no more than when I eat gyros. I tried a bit of my mother-in-law’s chicken kebab and liked it a lot and kinda wished I’d ordered it instead, but I had wanted to try something different so I’m fine with my choice. Oh and by the way, the bulgur was awesome. I am definitely going to experiment with it at home! All in all, everyone enjoyed our night out and I think I’ve finally redeemed myself for our last visit. I would definitely come back here next time we’re in town and if you’re in the area I recommend you give it a try. I live on the North side of Orlando but a trip down to the Dr Phillips area might well be worth the trip! Looks like a lot of vegetarian choices are to be had. Thanks for sharing. i’m glad you were able to redeem your bad chinese dinner. i don’t really like lamb or feta BUT the hummus and lavash look awesome.